Elizabeth ("Liz") and her husband, Lawrence are welcoming their second baby girl in September. Their first daughter, Emmylou, will be turning five soon and is so excited to be a big sister! Harper (my daughter) and Emmylou actually go to preschool together, which is how Liz heard about my photography business! 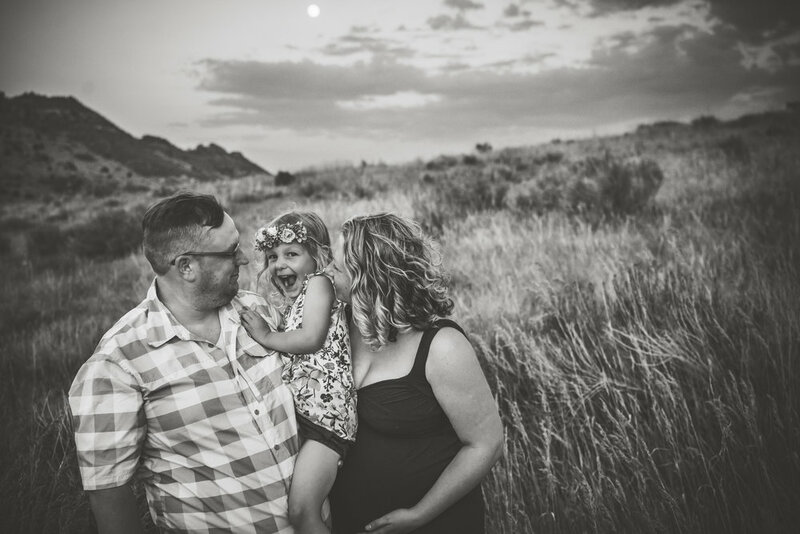 We decided to go to Mount Falcon in Morrison, Colorado for a sunset session. I cannot stress enough how gorgeous and worthwhile it is to have photos taken the hour before the sun sets. The lighting and colors cannot be replicated at any other time of day. So even if you need to keep your kiddos up past their bedtime, IT'S WORTH IT! Liz liked more posed photos while her husband enjoyed more of a candid approach. We incorporated both styles into her session and I could not be more thrilled with the results. Emmylou did a fantastic job the entire time, which is not the case for all children. I totally get how hard it is for kids to listen and be told what to do for an hour. As an anxious parent myself, I try to advise the parents to relax and just go with the flow when their kiddo isn't cooperating. We will still get awesome photos! However, Emmylou was seriously one of the best kids I have ever worked with, so no problem there! Here are some of my favorites from their session. I can't wait to meet their baby girl in a few months!